Looks you Desire. Strength you Trust. Ozarks Marble Kitchen and Bath Creations – Tubs, Sinks, Showers Countertops and Vanity Tops! Integrate the beauty of a Ferrari with the durability of a 4-wheel drive truck and you have Ozarks Marble Kitchen and Bath Countertops, Vanity Tops, Tubs, Showers, Whirlpools and more. At Ozarks Marble you have the option of Natural Stone, Cultured Marble, Cultured Granite, Cambria Natural Quartz product line, or the true look of Natural Stone formed into a design-flexible, easy-cleaning and low-cost surface that is solid to the core - TruStone™. Ozarks Marble Kitchen and Bath Creations has been manufacturing elegant countertops, vanity tops, whirlpool and jetted tubs, as well as showers and sinks, for Springfield, Missouri and the Ozarks since 1980. It is obvious we are dedicated to providing quality products with guaranteed satisfaction. View our list of product specs, stone selection, gallery and customer comments or, stop by and see us at our showroom – 3740 E. Evergreen, Springfield, Missouri. 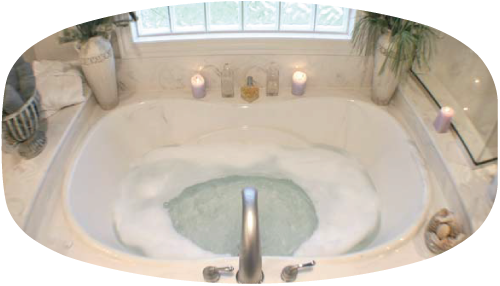 Ozarks Marble - Kitchen and Bath Creations has been a family business since 1978 taking pride in formulating new ideas for customers year after year. Quality craftsmanship, premium materials and the belief in their products makes Ozarks Marble an outstanding company to consult whether you are an individual, builder, architect or designer. See Ozarks Marble Family Photo. Choice and quality are rarely found together and that is exactly what you will find at Ozarks Marble Kitchen & Bath Creations. Because Ozarks Marble has been in business since 1980 formulating new ideas with premium materials you receive a kitchen or bath creation that is a step above the competition. All Ozarks Marble products are formed by skilled craftsmen. Whether you are looking for a standard vanity top for a do-it-yourself project or you are consulting with an architect or designer for a bath of your dreams, you will experience practical elegance at a price that fits your budget.Our care and high standards reflect in the durable beauty of an Ozarks Marble Kitchen or Bath Creation. Cultured Marble and Granite Advantages - A manufactured surface offers the consumer many advantages over other materials. Lower Cost - Even more beautiful is the lower cost of casting polymer materials. Ozarks Cultured Marble is able to produce large complex shapes at a fraction of the cost that it takes to form natural quarried materials. Design Versatility - Limited only by the imagination of the designer and producer. Each part is individually cast and pigmented making each piece unique in its color and pattern. Parts can be cast into almost any shape allowing the production of highly customized designs. Seamless Construction - Parts such as vanity tops can be cast in one piece with integral bowls and back splash minimizing crevices. Ease of installation is an added benefit to the seamless construction. 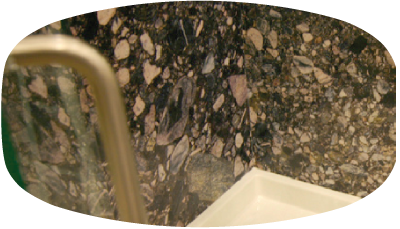 Natural Stone Advantages - Ozarks Marble uses only top quality Quartz and Granite. Both of these Natural Stones are beautiful, strong and durable. Both are low in maintenance and retains there value well. To learn more about the individual advantages of these natural choices go to their respective pages on this site. 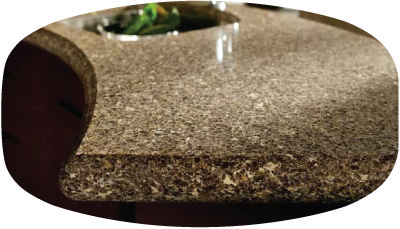 (Cambria Natural Quartz Countertops or Natural Granite Countertops). TruStone™ Advantages - Because TruStone™ uses an actual high resolution photo that is embedded into the surface, by a process called PhotoFusion, you receive the true look of natural stone (or image of your choice) with the flexibility of a polymer. For a little more about TrueStone™ along with a few samples visit our page about TrueStone™. Your product will be manufactured by Ozarks Cultured Marble's skilled craftsmen using premium quality materials. Our care and high standards reflect in the durable beauty of our cultured marble, onyx and granite. You can protect the splendor of your product and ensure a long life of trouble-free service by observing a few simple procedures. DO NOT clean this product with any abrasive material or cleanser such as steel wool, Comet®, Ajax® etc. These abrasives will dull the lustrous finish. We recommend Gel-gloss, a one-step cleaning process for our products. You may choose to clean your marble or onyx with liquid cleaners such as Fantastic®, 409®, Mr. Clean®, or any other non-abrasive liquid cleaner. An occasional wax, about once a year, with a non-abrasive wax will produce a shinier surface and make future cleaning easier. Hard water scale and rust stains can be removed with Lime-A-Way® bathroom and kitchen cleaner. Polishing compound can also be used to buff out minor surface scratches. Deep scratches or chips should be handled by a professional cultured marble repair person. Do not let harsh chemicals such as Clorox®, Hypochlorite Bleaches, Hydrogen Peroxide, Drano®, Sani-Flush®, Paint Stripper, or other abrasive cleaners come in contact with your cultured marble, onyx or granite. Ozarks Marble warrants all cultured materials to be free from defects in material and workmanship for one full year including an extended four year pro-rated warranty. A full copy of our limited warranty is available for your inspection. Cambria Warranty - Lifetime Warranty (go to Cambria for more details).